Does your resume project energy? Make sure it’s ready for opportunities created by the stimulus by comparing it to this sample resume. To be the successful job candidate in any field, it helps to have a comprehensive resume. 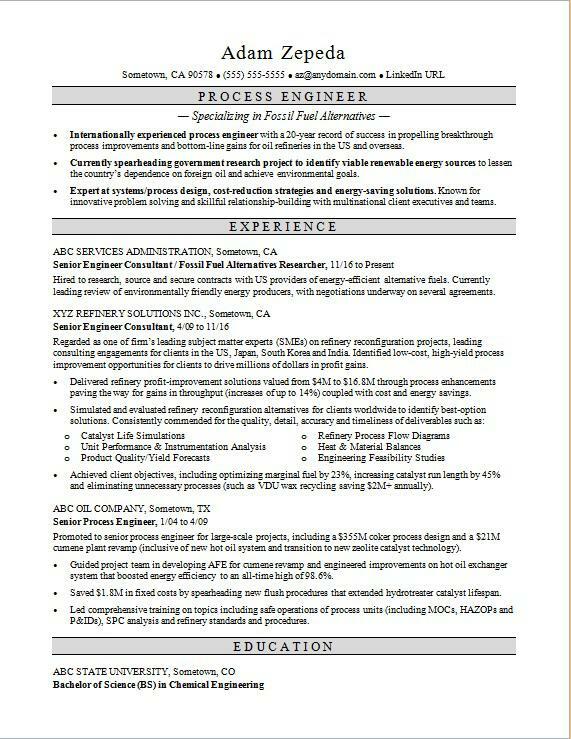 View the sample resume for a process engineer below, and download the process engineer resume template in Word. And if you need more help, get a free resume evaluation from the experts at Monster's Resume Writing Service. Jobs for process engineers are projected to grow by 10% (or 25,100 jobs) from 2016 through 2026, according to the Bureau of Labor Statistics (BLS). You’ll find the highest level of employment for this job in the following states: Michigan, California, Texas, Ohio, and Illinois; and in the following metropolitan areas: Warren, Michigan; Minneapolis, Los Angeles, Chicago, and Detroit. In this job, you can expect to make a median wage of $85,880 per year, or $41.29 per hour, according to the BLS. Additionally, you can learn more about engineering careers and search for process engineer jobs on Monster. Internationally experienced process engineerwith a 20-year record of success in propelling breakthrough process improvements and bottom-line gains for oil refineries in the US and overseas. Currently spearheading government research project to identify viable renewable energy sourcesto lessen the country’s dependence on foreign oil and achieve environmental goals. Expert at systems/process design, cost-reduction strategies and energy-saving solutions.Known for innovative problem solving and skillful relationship-building with multinational client executives and teams. Hired to research, source and secure contracts with US providers of energy-efficient alternative fuels. Currently leading review of environmentally friendly energy producers, with negotiations underway on several agreements. Regarded as one of firm’s leading subject matter experts (SMEs) on refinery reconfiguration projects, leading consulting engagements for clients in the US, Japan, South Korea and India. Identified low-cost, high-yield process improvement opportunities for clients to drive millions of dollars in profit gains. Delivered refinery profit-improvement solutions valued from $4M to $16.8M through process enhancements paving the way for gains in throughput (increases of up to 14%) coupled with cost and energy savings. Achieved client objectives, including optimizing marginal fuel by 23%, increasing catalyst run length by 45% and eliminating unnecessary processes (such as VDU wax recycling saving $2M+ annually). Promoted to senior process engineer for large-scale projects, including a $355M coker process design and a $21M cumene plant revamp (inclusive of new hot oil system and transition to new zeolite catalyst technology). Guided project team in developing AFE for cumene revamp and engineered improvements on hot oil exchanger system that boosted energy efficiency to an all-time high of 98.6%. Saved $1.8M in fixed costs by spearheading new flush procedures that extended hydrotreater catalyst lifespan. Led comprehensive training on topics including safe operations of process units (including MOCs, HAZOPs and P&IDs), SPC analysis and refinery standards and procedures.